Over 30 years experience. Global shipping. 100% satisfaction guaranteed. When it comes to getting the right materials for your concrete formwork job, Independent Forming has the information and the materials that you need. So when it comes to new and used concrete forms, how do you decide between steel-ply or aluminum? We understand that you have a job to get done on time and under budget and to do so requires that you be focused on worksite safety, efficiency, and productivity. In today’s blog, we’ll help you choose the best materials for your job so you can save time on researching and get down to business. When you’re ready to purchase or rent concrete forms for your project, give our concrete form brokerage a call to get the best prices and save yourself even more time. Concrete forms for walls, footings, slab, and pillar pouring all have one major requirement — they need to be strong to withstand the weight and pressure that all that concrete is going to put on them. 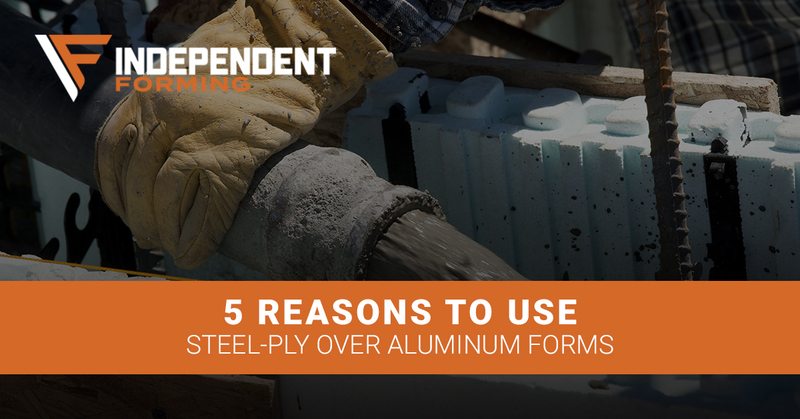 Although aluminum is lighter weight than steel and can be preferred by laborers for that reason, it’s pretty hard to beat the durability of steel-ply concrete forms. Lots of factors go into determining the pressure that your cement forms are going to have to withstand, including pour speed, concrete temperature, and concrete composition. At the end of the day, the benefit of lightweight aluminum forms is often going to be overshadowed by their comparative weakness when stacked against their steel-ply concrete form counterparts. Besides being able to hold up to heavier pours and more pressure, steel-ply concrete forms are also going to have a longer lifespan than aluminum forms. For contractors who are buying new and only planning on using their forms for a few years before looking for new products, this might not have much bearing. For contractors interested in purchasing used concrete forms or who plan to use their materials until the bitter end, steel-ply forms are a clear choice. Numbers vary from manufacturer to manufacturer but on average a well maintained steel-ply concrete form should last as long as 3,000 individual uses. Average estimates for the lifespan of an aluminum concrete form for walls is roughly two-thirds of that. So if you’re in the market for long-term use or you want the confidence that your used concrete forms are going to be serviceable for years to come, let Independent Forming help you find the best used steel-ply forms on the market. It’s true that aluminum forms are cheaper out of the gate than steel-ply forms. It’s one of the most attractive things about them and likely is a pretty big factor in the success that they have had against superior materials on the market. Over time, however, the better durability and longer reusability of steel-ply forms overcome the initial value of aluminum and make steel-ply concrete forms a distinctly more cost-effective way to complete jobs. At Independent Forming, we have found that long-term savings are something that our clients care about a lot — that’s why we work hard to find great deals long-lasting steel-ply for our customers. Designing and constructing custom formwork for each and every job is time-consuming enough without having to add extra steps into the process. Steel-ply forms are relatively simple to put together into almost any variation or format. All your crew will typically need is hammers for securing connectors. By contrast, aluminum forms can require a special welding process that requires more tools, more skilled laborers, and most importantly, more time. Even beyond this, aluminum set forms are all but impossible to make changes to, meaning that once your formwork is built, no architectural adjustments can be made without a tremendous effort and time expenditure. Mistakes get made and steel-ply concrete forms are much more forgiving when they do. Finally, we will touch on one of the single biggest priorities on any worksite — liability. Nothing takes the wind out a project like an injured worker of a slew of insurance claims due to stolen materials. The increased labor or building large formworks and the tools required to manage it create a slightly more risky work environment that is completely avoidable. Steel-ply forms’ flexibility and simplicity mitigate risk and keep your workers safer and more productive. A much more likely problem for you to run into is theft. Over the last decade, the increased payouts for recycled aluminum has made aluminum forms a target of thieves at job sites. Everyone in the construction industry knows that theft and loss on a site are a legitimate worry as it is. Why use lightweight, easily carried, and lucrative materials when you don’t have to? No matter what your concrete formwork job is, or what materials will be best for it, Independent Forming is here to help. We can locate and manage the transaction for your new or used concrete forms whether you are buying, selling, renting, or leasing. Contact us with your team’s needs today or give us the details of your formwork needs online and get a free estimate. We can’t wait to help you get to work. ©2018 Independent Forming, LLC - Do not copy. All rights reserved.